Permanent, Colorfast and Very Washable. Just mix cold water dye with soda ash. 8-oz. singles. Please specify color when ordering. Follow mixing instructions on the bottle. When mixed with soda ash, cold water dye is permanent, colorfast and very washable. 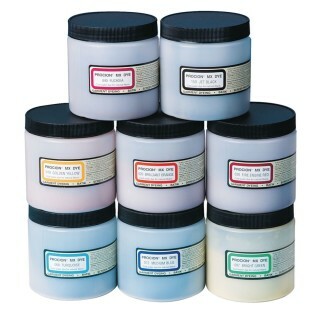 Great for tie-dye and dyeing fabric. 8-oz. singles. Please specify color when ordering. Adult supervision required. Follow mixing instructions on the bottle. Mix 2 level tbsp of dye to 8 ounces of water. Presoaking the garment in soda ash (sold separately) helps with color retention. This dye is wonderful. A little goes a long way!! I love how you are able to mix your own colors too. For best success be sure to use pre-washed super important 100 cotton soaked in soda ash solution. Dye then keep in plastic bag 24 hrs. We used these for a camp activity and weeks later the kids are still raving! I have used this dye for tie-dying with large groups several times! The color quality is great and far exceeds using the packets from the craft store. The size of the container and ability to be used more than once is amazing! We have been using this dye at our summer camp for the last several years. We have a really high volume of tie-dying that we do and this is some of the best dye with with high quality results we have found. Make sure to get the soda ash as well. Every year at our weeklong Girl Scout campall 250 campers tye dye tee shirts. We have always used the cold water dye and get excellent results. It is easy to mix right in the bottle with water and the color variety is just what we need.